fits perfectly with the current botanical trend. I would usually steer well clear from a white dress but with the beautiful, unique print I could not help myself. I love reproduction vintage because it saves the hassle of finding an affordable piece that fits, flatters and is good enough quality for regular wear. fair and I fell in love with it straight away. The fit and flare style is something I'm always drawn to, however, the waistline on this piece is higher, cutting almost directly under the bust, giving a slightly different look. The light-weight cotton material will make this dress perfect for warm summer days and I can't wait to wear this on trips to the beach or at summer BBQs (if I get invited to any!). I paired it with my trusty tan flats but it could also be dressed up with a pair of red or orange heels! Check out my post on the York Does Vintage Fair here. Like this style of post? 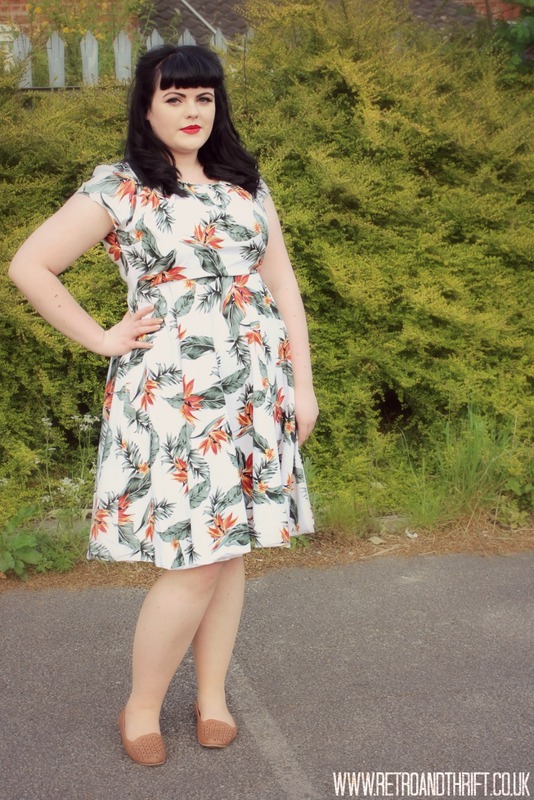 I reviewed dress from JOY here!